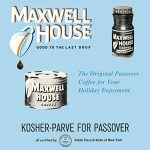 Kraft Heinz’s Maxwell House Coffee has created a joint promotion with Amazon Prime Video’s Emmy and Golden Globe Award-winning series, The Marvelous Mrs. Maisel, to celebrate the Jewish festival of Passover with the release of a limited edition version of its classic Passover Haggadah. 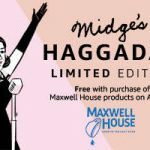 Midge’s Haggadah has combined the 1958 classic version of the Maxwell House Haggadah with the character of Mrs. Maysel. The limited-run Haggimmicks – or Haggadahs – are available only on Amazon.com while supplies last for those who purchase Maxwell House K-Cups and other products. Over the past eight decades, 50 million copies of the Maxwell House Passover Haggadah were distributed, which is more than a couple haggadah’s for every American Jew who lived over the past 80 years. The Marvelous Mrs. Maisel was created and written by Amy Sherman-Palladino and Daniel Palladino. Amy says she was raised sort of Jewish. The Amazon Prime series is set in 1958 New York City and tells the story of a married woman with a perfect husband and two kids on Manhattan’s Upper West Side. But like Joan Rivers, wh decides to embark on a career i nstand up comedy. The series stars Rachel Brosnahan as Miriam “Midge” Maisel, Tony Shalhoub as her father Abe Weissman, Alex Borstein as Susie Myerson, Michael Zegen as Midge’s husband Joel Maisel and Marin Hinkle as Midge’s mother Rose Weissman, Kevin Pollak as Moishe Maisel and Caroline Aaron as Shirley Maisel. The haggadah contains a bonus: Mrs. Maisel’s recipe for brisket. Another bonus are fake wine stains and some handwritten notations by “Midge Maisel.” But guess what, it isnt in Rachel Brosnahan’s writing style… it may be the work of a skilled graphic artist. The four questions or four children don’t embed the characters, but there are illustrations of Midge and other featured characters on many pages. Maxwell House coffee was the first coffee to receive a Kosher for Passover certification in 1923. In 1932, it published its first haggadah as a Passover shopping promotion. Maxwell Heinz (NASDAQ: KHC) stock price was up slightly in early morning trading after the announcement. But this may be unrelated to the Haggadah’s publication. For Jewlicious readers on Manhattan’s Upper West Side, please note that the Mrs. Maisel production is shooting Season 3 near West End Avenue between West 83rd and West 84th on April 3. Next Story → Israelis Want to Know: What are American Jews Like?